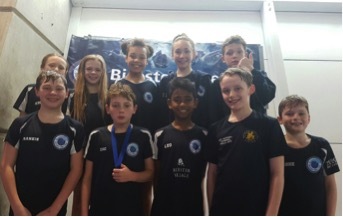 Swimmers battled it out at The Alternative Counties Maxwell Level 3 meet over the weekend of 11th and 12th March and the Bicester Blue Fins squad were out in force with 46 swimmers competing and entering 253 swims in total! The Bicester Village sponsored Club clocked up an impressive 192 Personal Bests, equating to 76% off all swims achieving a new personal record! Tia Falkner in age 12 100m Butterfly smashed her personal best by 6 seconds with 1:15.09 SER Base Time!! Tom Henley produced consistently big swims in various races within the Boys age 11 category. Emma Littlejohn took a huge personal best in the age 12 100m Breaststroke of 1:45.09 - faster by 24 seconds. Chris Littleton achieved SER Auto Times in both 200m Backstroke - 2:28.16 and the 200m Butterfly - 2:37.94 in the age 13 category. Josh Rowland was back in the over 16 year olds with some sprint speed getting Personal Bests in 100m Freestyle (54.12) and 50m Freestyle 24:52, which means he has achieved a new Club Record from previous holder Tom Thornley. Thomas Whitley also had some outstanding swims in the age 13 category with a 6 second personal best in 100 Individual Medley and a 3 second personal best in the 50m Butterfly with 31.55. Plus a new PB in the 50m Freestyle with 30.17. Freddie Whybrow in the over 16s also had two great Individual Medley swims in the 100m & 200m getting a 5 and 6 second personal best respectively. The Head Coaches Swimmer of the Meet was 15 year old Stephen Taylor who managed to achieve new personal bests in every single race! He knocked 5 seconds off in 100Inidivual Medley, 2 seconds off in 100m Butterfly, 7seconds off in 200m Breaststroke with 2:31.91 and put a goal of national qualification into the mix for the 1st time!! Stephen also achieved 59.98 on the 100m Freestyle for his 1st time under 1:00 and 27.46 in the 50m Freestyle (2 second personal best) and a huge 10 second off his previous personal best with 2:09.87 in the 200m Freestyle. The following swimmers were finalists so huge well done to all of them! Overall the meet was a massive success highlighted by the huge number of personal bests achieved by the swimmers! The swimmers always enjoy the Maxwell meets for their fast swims and great atmosphere and this was no exception. The pre-pool exercises were performed wonderfully by all the squad attending and Craig would like to extend special thanks to the senior swimmers for guiding the younger ones on this as a team. With the amount of SER times achieved, things are looking exciting for regionals after Easter! Huge well done to everyone as Blue Fins go from strength to strength!